Tickets will be available for sale online Monday, January 15 at noon. Tickets will also be available at the door based on availability. Online tickets ensure entrance. Tickets can be purchased online via our website under the “Buy Tickets” tab. The opening weekend for the exhibit is February 18 and 19, the Museum will be open from 10 a.m. to 5 p.m. The Stratford Perth Museum will be closed on Saturday, February 17. Tickets for the opening weekend will be sold with admission in two-hour time slots – 10 a.m. – noon; noon – 2 p.m.; 2 – 4 p.m. The museum’s hours and admission prices are also on our website. The Stratford Perth Museum’s summer hours begin May 7. Steps to Stardom tells the story of Justin Bieber’s meteoric rise from busking on the steps of the Avon Theatre to becoming one of the most popular pop stars in the world. The Museum has been given access to hundreds of items – awards, clothing, pictures, all-access pages, personal letters and even running shoes and we are now in the process of collecting the items for exhibit. 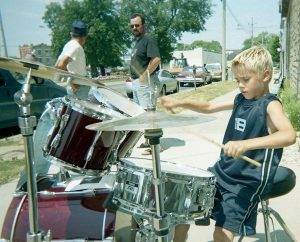 In addition, a number of things have come forward from Stratford residents that have also been offered to the Museum — team pictures, hockey jackets, drum sets, even library cards, that were used by Justin before he was an international pop star. The exhibit tells the story of the Stratford native’s career from those early years – busking in Stratford and performing in local talent shows – to the largest venues and stages in the world. The exhibit, created by the M useum in conjunction with Justin and his family, opens February 18 and will be on display until at least the end of 2018. At that time the Museum and Justin and his family will decide if the exhibit will be extended into 2019. This exhibit is made possible thanks to a sponsorship by Hyde Construction. Photo credit: Stratford-Perth Archives, The Beacon Herald collection. July 2002.